Whether you are a student thinking about a career in chemical engineering or a faculty member looking for resources on safety, there is only one person to go to. 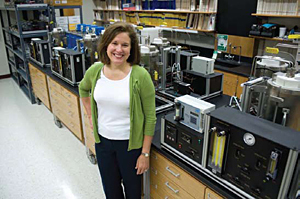 Meet Linda Davis, industrial education director in the School of Chemical Engineering. In this role, Davis wears a number of different hats, each in the service of supporting and advancing students in their scholarly and professional pursuits. Davis, a chemical engineer, joined Purdue in 2007 after 24 years in the industrial sector, many of those at Air Products and Chemicals, serving in various engineering, business and management roles. Known as the “go to” person for students seeking to gain professional guidance and advice, Davis realizes the importance of her position. The assortment of student-centered activities in which she has a hand speaks for itself. Davis manages 70 students within the chemical engineering co-op program, instructs an array of professional development seminars for students, oversees the Fundamentals Lab — a state-of-the art teaching laboratory — in Forney Hall, and dedicates a significant portion of time to reviewing student resumes and providing job search coaching to both undergraduate and graduate ChE students. When not teaching or interacting directly with students, Davis takes time to look at the bigger picture. “One of my large personal initiatives recently has been the Women In Chemical Engineering Seminar that was launched in spring 2009,” she says. The seminar, which took place in April, was a rewarding success for Davis, who served as organizer and host. Sponsored by Shell Oil, the event boasted the participation of 57 undergraduate and graduate female chemical engineering students, chemical engineering alumnae, and chemical engineering faculty and staff. Attendees met to discuss and network on career choices, opportunities and challenges for female chemical engineers. A committee of students, alumnae and staff helped with the planning and execution. Recently, a collaboration between Davis, Professor Michael Harris and ChE alumna Deb Grubbe led to the concept of an undergraduate elective course in chemical process safety. Currently being developed, the course will debut in spring 2011. This focus ties in well with another hat Davis wears, that of chair of the ChE Safety Committee.